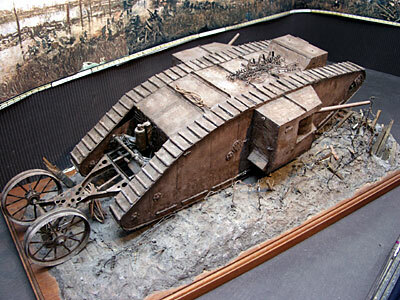 Charlie Wyn-De-Bank built this model of a Mark 1 tank, the first tank to be deployed anywhere. It is the “male” version with 6 pounder naval guns fitted – the “female” version had machine guns. The wheeled assembly at the rear is the steering mechansim. 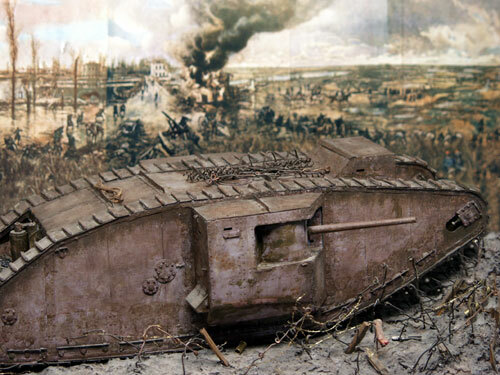 The model is shown in front of a panorama depicting the First Battle of the Yser in 1914 – tanks were not used there. 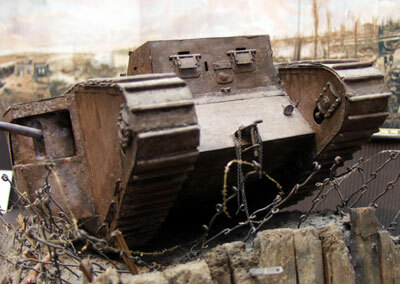 The deliberate flooding of the River Yser (Ijser) in Belgium stopped the German’s advance in 1914, and lead to the establishment of the northern position of the Western Front. The town across the bridge in the background of the photo is Dixmuide (Diksmude, Dixmude) – the town where the flooding ended and the Ypres Salient began. (The original panorama is at the British Legion Club in Newport Pagnell – this is a smaller copy).